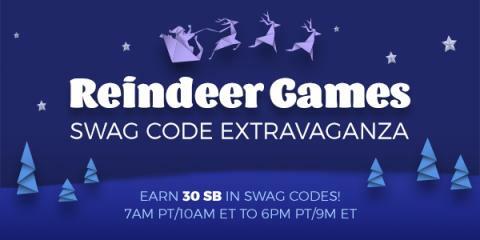 I love when Swagbucks has Swag Code Extravaganzas because they are one of the easiest ways to earn SB! What are SB, you ask? SB are points you earn on Swagbucks, a website where you can get gift cards for the things you do online - I've gotten almost $400 with Swagbucks! What are you waiting for? I have done A LOT of online shopping this year because I don't like crowds, so I have earned Swagbucks with Lego.com, Target.com, Walmart.com, Amazon.com, ToysRUs and more! The holiday cheer begins on Wednesday, December 21st from 7 am PDT/10 am EDT to 6 pm PDT/9 pm EDT. All you have to do is look out for the Swag Code notifications, enter the code, and you earn SB (which can be redeemed for gift cards)! There will be 6 Swag Codes throughout the day worth a total of 30 SB.